Is Jordan Winning Its Battle Against Domestic Extremism? Jordanian security forces on patrol in Karak, where 10 people were killed by Islamic State gunmen, Dec. 19, 2016 (AP photo Ben Curtis). Last month’s terrorist attack in Jordan, which the self-declared Islamic State quickly claimed responsibility for, was a brutal reminder of the kingdom’s fragile security situation. Gunmen attacked a police station in the southern city of Karak and then stormed a Crusader castle popular with tourists. 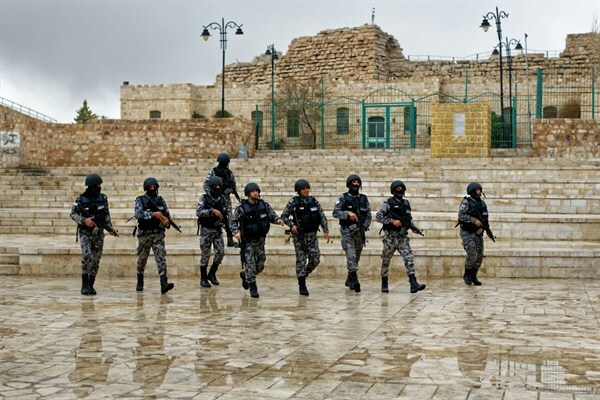 They killed nine Jordanians in the firefight, including seven security officers, and a Canadian tourist. In the days after the attack, three Jordanian gendarmes and a police officer were killed in security raids in Karak, where authorities discovered a huge cache of weapons and explosives that apparently belonged to the gunmen.